Length: 22 inches head to toe. These are actually just my guesses. The baby is late now. We are ready! This was taken at 22 weeks. If you look closely, you can see the face and arms. ~ 07.23.01 - OK, I admit I am a slacker. The baby is due today, but there arn't any signs yet. Katie has an appointment tomorrow and I promise to give an update then. Yep just one boy name so far. Of the girl names, Kayla is new, but the other for we had picked out in case Kyle wasn't a Kyle. ~ 01.30.01 - I haven't been updating this site becuase we havn't told everyone yet, and the link wasn't there from the main page. Katie went to another visit to Margan. Everything looks good so far. Katie was able to hear the heart beat. Next time I will try to bring in a tape recorder to get a sample. 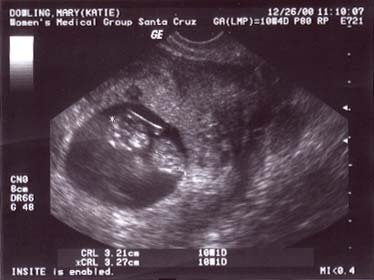 ~ 12.26.00 - We just got back from our visit with Margan, Katies midwife, and got the ultrasound you see. 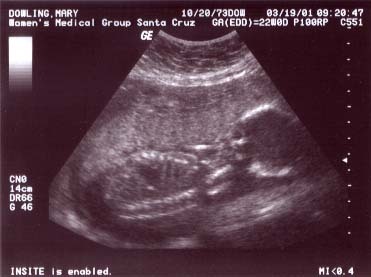 The ultrasound was unexpected surprise. Again we are very excited and can't wait for those midnight feedings.